I arrive to find my buddy, Joe, sittin' on the couch, totally bummed out. He's lost his place here, and just found out the other day, and was still pretty much in shock. He's been here a while, and thought he had an agreement to have a chance to buy the place if it ever sold. But instead, it got sold to a developer without warning. This called for emergency action, so I grabbed a set of bongos and got started on musical transfusions and electrical jamming resusitation techniques. We jammed most of the night. It was still a bummer. He's been here a long time. I helped work on this place, and have been visiting here for years. Technically, this has also been also my residence, for many years now. One reason I came here was to get the chance to vote. I helped him rehab this place, times I visited. And now its gone. But I don't want to dwell on it. I tried to get things moving, break the impasse, and not dwell on it. So I build a fire in the woodstove, and we keep jamming, and I pitch right into the effort of cleaning up and beginning the sad and dirty job of moving everything and clearing away the junk, get Joe focused on the job at hand. I end up staying here almost three weeks... longer than I've done in years. Being a Montana resident is really a technicality, though this is one of my homes. I really don't know anywhere I am really a resident, technically, except maybe North America. Though I guess I spend more time in Alaska than any place else these days, that is just these days. But back to the point, which is people are more important than anything, and Joe is my friend, one of the best, and needed a hand; so I was there. 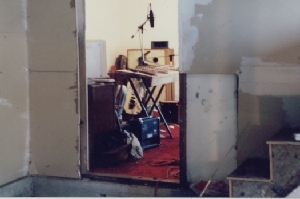 I set up the recording gear as well, so we'd work and jam and work and record and work and jam some more. We've been doing this for years, I mean the jamming part, mostly. 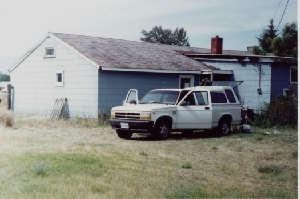 I'd stop in here regularly when I was spending summers walking about in the mountains of Montana, when this was my mountain base between when I left the development in Colorado and before I started going to Alaska. I met Joe at a part, many years back. I'd actually come because I'd heard there was a guitar player coming and hoped to jam. We jammed that night, and have been at it ever since. We were both serious jammers. Wanting to have fun, yet for both of us, it meant making the real effort to work it out right, to get a seriously well crafted version of whatever we chose to play. We both brought that seriousness and dedication to the music, including our jamming, that is often hard to find when people just want to bibble around and not focus on getting it down. We were still havin' a good time, though, for sure. The recording wasn't anything serious, really, we were both too tired and distracted to focus, and there was this big job to do, but I wanted Joe to experience the gear, and see what we could do in the future. Besides, I wanted to capture the jams as well, that's part of the idea of having the gear, and making setting it up just part of the routine. This is another point, though. I really want to record with Joe, he's both the best guitar player I know, and even if he wasn't, he's my buddy, and I'd rather play with him, and he is certainly good enough. Still, the point is that though this might not be the best time to record, it's a great time to jam. It's hard times, and we can leave it all behind as well as let it out, playing the Blues. This is what it's really all about. I come flying off the road, burnt out and tired. But I stay for a while and we jam, and its good for both of us. We've both paid our dues, and we don't need anyone to hear what we're doin'; this is for us, personally and as musicians. People come over and people leave, but behind and beneath it all, Joe and I are jammin'. We might stop for this or that, but as soon as we sit down, we pick up a guitar, or whatever is handy, and pretty soon we're at it again. This is usually a chance for me to get away from the dulcimer as well, to play guitar again and sing, or play bass, keyboard, hand-drums, or marimba. A lot of times I'd be playing songs I'd been playing on the dulcimer, hearing it in my head, and playing the guitar to follow it, imagining what the band sound would be like. At the same time, its one of the few chances I get to hear the dulcimer with a lead player. The problem is that without a rhythum player that can follow me, or me playing rhythum, Joe has a hard time following what I am doing on the dulcimer. Fact is, I usually get the rythum player doing approximately what I want, then follow them, since that's easy for me. I'm used to jamming and picking up the beat from someone else. The fact is that I can follow a guitar easy enough, I play it. But following the dulcimer isn't easy, learning to hear and understand what is going on in the mass of notes and synchopated beats. 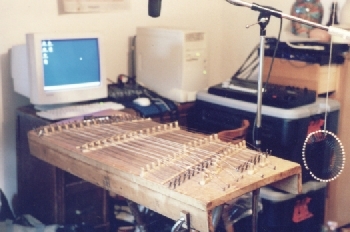 Though I love the dulcimer, I've always been a singer first, and played rhythum guitar for years. I've missed this in the dulci, because its sometimes hard to get people to understand the sound. The dulcimer is so much about rhythum and as soon as you get into the blues and such, it drops into the synchopation. Which is great, except I've never had anyone to carry the rhythum behind it, and people get lost sometimes. So I get to play the music I want to play, whether it's part of my dulcimer repitoire or not. Also, through Joe, I get exposed to new muusic, as I learn to back up the leads he's been working out from the tab. It forced me back into more disciplined playing, even while on his side, he learned to leave the original more, to jam both inside that and with the often radically different versions I'd come up with. It's turned out to be a great balance between us. We've done everything from playing anything that came to mind, or originals I'd come up recently; to learning to play the entire album "Dark Side Of The Moon" over one summer, with Joe doing all the lead from the tab, and me handling everything else (except that lady with all the wild vocal stuff).